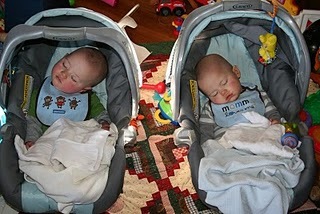 We made the switch a few weeks ago – no more baby bucket car seats. Wyatt was over the height limit and with their winter coats, the straps were getting too tight. The seats were also getting very heavy, especially carrying both at the same time. But I could manage both seats and the diaper bag if necessary. I could park next to the cart return, get the cart first and then load their seats in the cart. If they fell asleep in the car there was no need to wake them up when we reached our destination – just carry the seats in the house and let them keep sleeping. 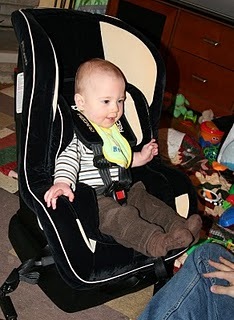 2 – Carry Wyatt to the van, buckle into car seat. Lock van. I *have* jumped for women who look like they're struggling. One memorable time was in Burger King; the mom was very grateful to me. But other times, I've gotten odd looks from the moms, like they are afraid they'll catch what I've got. At any rate, know if I'd been there, I'd have helped. Woman, you deserve a medal. Oh, but I don't have any medals, would you settle for a cookie? Actually, you deserve more than a cookie, how about a box of cookies? Girl Scout cookies? I'll steal some from Burghbaby for you.